I'm interested in the dynamics of the Solar System, particularly its smaller bodies: asteroids, comets and meteoroid streams. I'm also interested in the dynamics of planets around other stars ('exoplanets'), their effects on each other and nearby disks, and in celestial mechanics in general. Looking for Master's or PhD supervisor? I'm always looking for new graduate students, so if one of these fields sounds intriguing, please contact me: pwiegert[at]uwo.ca. For more information about applying see the web page for the graduate program in Physics & Astronomy at Western. There is also a list of potential research projects. (9-Oct-2018) Kepler-159b and c are exoplanets detected by NASA's Kepler planet-hunting spacecraft. Kepler-159d was discovered at Western University from its gravitational effects on 159b and c. Kepler-159d has about the mass of our planet Saturn, and orbits within the Habitable Zone of its distant (1200 light-years away) host star, but little else is known about it yet. Click on the animation, or here, for more. (30-Mar-2017) Asteroid 2015 BZ509 is a rare retrograde asteroid, that is it orbits the Sun in the direction opposite that of the planets and 99.99% of the other asteroids. Stranger still, it also shares the orbital space and an important dynamical link with the giant planet Jupiter. 2015 BZ509 is a retrograde analogue of Jupiter's Trojan asteroids, and is discussed in the 30 March 2017 issue of Nature. 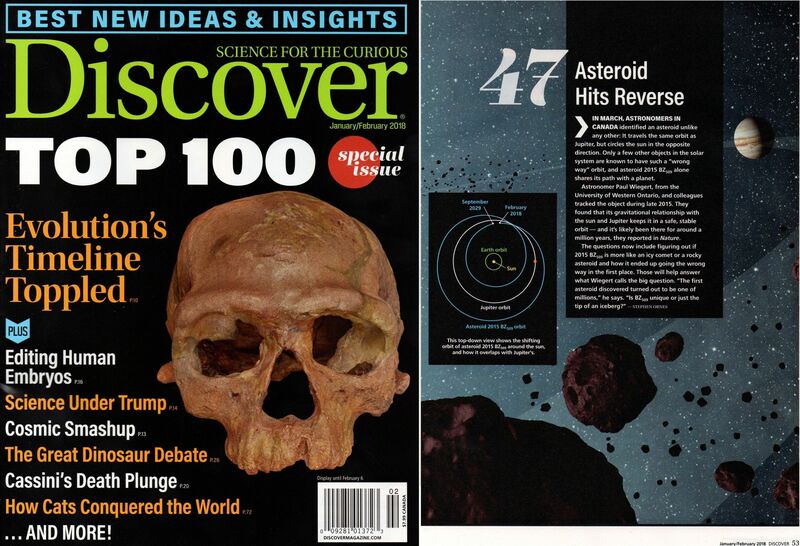 The paper made #47 on Discover magazine's Top 100 of 2017. Click on the left movie, or here, for more. On 14 November 2013 in the journal Nature, a team of astronomers including myself present a definitive analysis of the asteroid that burned up spectacularly over the Russian city of Chelyabinsk in February 2013. To the left you see a simulated ride on the asteroid during its final approach to our planet. Click on it for more info and a bigger view. Canadian and French astronomers analyzed the motion of the as-yet-unnamed asteroid designated 2010 TK7, first detected by the the WISE satellite, to determine that it was the first classical Trojan asteroid of the Earth. If you would like to know more about 2010 TK7 and its motion, reported in the 28 July 2011 issue of Nature, click on the movie to the left. Debris disks are gas-poor collections of solid matter which orbit some stars. Structures in the disks can reveal the presence of nearby planets which are themselves too faint to see. For more information, you can check out my former PhD student Maryam Tabeshian's recent 2016 and 2017 Astrophysical Journal papers.